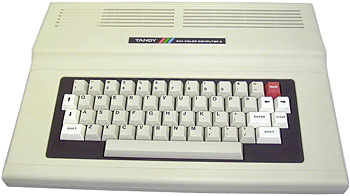 There were several models of the Coco2, some with only 8k ROM (Color Basic) called Standard Color Computer 2, and others with 16k ROM (Extended Color Basic) called the Extended Color Computer 2. Some later models differ also in RAM capacity (16k, 32k or 64k). It was replaced with the Color Computer 3 in 1986. The double speed mode was not really accomplished by changing the clock speed. The Synchronous address multiplexor (SAM) chip by default generated memory refresh cycles for the entire address space. the "double speed poke" disabled the refresh cycle for the upper 32k memory address, where the ROM was mapped. Since the ROM was static, it didn't need this and since BASIC spent most of its time in the rom routines, it would appear to nearly double the speed. The flip side of this was that many I/O functions that relied on timing loops would be unusable, such as saving data to a tape. Also if you were using the upper 32k of ram, the double speed poke would wipe the memory. KEYBOARD Full-stroke keyboard, 53 keys. see more Tandy Radio Shack Color Computer 2 Ebay auctions !